You can bring the bright atmosphere of a tropical vacation into your home with indoor plants. An integral part of your home décor, indoor plants not only artistically improve your home, they also cleanse and freshen your indoor air quality. Plants take in carbon dioxide and release clean, pure oxygen. Some plants even absorb certain air toxins, potentially harmful radiation or unpleasant smells. Indoor plants also add welcome humidity to the air we breathe, and filter dust particles for a cleaner environment. While indoor plants can improve your life in many ways, they must be selected to fit successfully into your lifestyle. When selecting a foliage plant, first determine what type of light you have – this will be the best key to the plant’s health and survival. Look at the area where you would like to keep the plant through the entire day to determine if the light changes. You will also want to keep in mind the time of year – the light will change with different seasons as well as the angle of the sun. Low Light – 3-4 hours of indirect light. Don’t confuse this type of light with no light. If you can sit in the room and read comfortably without turning on a light, it is low light. If you must turn a light on, then it’s considered no light. Medium Light – 4-6 hours of indirect or direct morning sun. High Light – Direct or indirect sun for 6-8 hours a day. Direct afternoon sun in the winter can be too hot for many houseplants. Be careful this time of year because many plants can get sunscald. If you aren’t sure what your light may be or which plants may thrive, we also recommend you talk to one of our experts about your particular situation for best results. The most common cause of death of an indoor plant is overwatering. The second most common cause is underwatering. So it’s important that you watch out for the watering needs of your indoor plants. The smaller the pot, the more frequently you will need to water your indoor plant. Small pots (2-3 inches) might need water every day depending on the plant’s needs and the richness of the soil. A 4-6 inch pot may need water every 3-4 days, whereas a 10-inch pot (or larger) usually only requires water every 4-6 days. These guidelines can change depending upon the location of the plant, the type of pot, variety of plant, soil condition, general humidity, time of year and weather conditions. Plants don’t utilize as much moisture on gray days as they do on sunny days. Plants that prefer drier conditions may need to be watered only every two weeks. Because so many factors can impact indoor plant watering, determining the watering schedule for large pots (over 10 inches) can be difficult. To help, take a natural wooden dowel and push it into the soil until it reaches the bottom of the pot. After you pull the dowel out, you will be able to see the wetness on the bottom of the stick (if there is any). Also, remember that the larger the pot, the more water will be held in the soil at the bottom – even if there are drainage holes. Despite their water requirements, most all indoor plants grow naturally in the tropics. Therefore, they appreciate a humid environment, which most homes do not provide. Home heating systems can be especially drying in the winter. Keep a hand held mister close by and give their leaves a spritz every now and then. It wouldn’t hurt to do it every day. 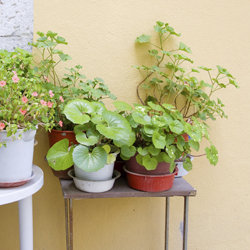 Keeping bowls or trays of water near your indoor plants is also helpful. As the water evaporates, it puts more moisture into the air around your plants. Most foliage or non-flowering houseplants will thrive with occasional fertilization. You can increase the feeding to twice a month during the growing season. Flowering plants have different fertilizing needs depending on their bloom schedules and growth productivity. You can find fertilizers specific to certain indoor plants, such as African Violets and Orchids. Investigate the needs of your individual plants and feed them appropriately. Use a general indoor plant fertilizer and follow the instructions on the package. Houseplants can add great beauty and many benefits to your home. 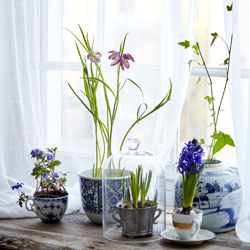 Once you begin choosing houseplants, you’ll soon be enjoying them in every room and every season.